The Pakistan Mercantile Exchange (PMEX) has decided to offer MetaTrader 5 to all its market participants. This means that 333 PMEX members will be able to operate their business on MetaTrader 5 and to offer advanced trading and investment facilities to their clients. The cutting-edge functionality of the popular platform will become available to Pakistani traders, including the most powerful automated trading possibilities through the desktop application, mobile applications for iOS and Android devices and the full-featured web platform. Also, traders will be able to rent virtual hosting servers, apply technical indicators from the Market and use other MetaTrader 5 services for the optimal PMEX futures trading experience. Established in 2007 in Karachi, PMEX is the first and only futures market in Pakistan regulated by the Securities and Exchange Commission of Pakistan (SECP). "In early 2015, we announced the MetaTrader 5 integration with PMEX, and a month later one of Pakistani brokers started offering the new platform to their clients," said Gaies Chreis, MetaQuotes' Chief Operating Officer. "Now, after three years, PMEX completely switches to our software. This is definitely a beneficial step for all members of the exchange. Operating on MetaTrader 5, PMEX will be able to smoothly connect institutional clients, while brokers will be able to provide their traders fast and reliable access to the exchange. As for traders, they will certainly appreciate the comfort of trading through the advanced ecosystem of the fifth generation platform. Our wish is for other exchanges to follow the example of PMEX". Mr. Ejaz Ali Shah, Managing Director of PMEX stated, "PMEX is proud to announce the availability of MetaTrader 5 for all its Market Participants. The offering of MetaTrader 5 by the Exchange is in line with its technological overhauling strategy. The Exchange has always remained proactive in identifying and exploring ways for improving its existing technology infrastructure to allow its members and clients a seamless trading". The company launched a portfolio of upgraded risk-management solutions. These products are fully-compatible and synchronize seamlessly with the MetaTrader 5 platform. Inspired by the growing trend towards fully-automated, risk-managements technologies, Centroid Solutions released a set of simple, yet very sophisticated solutions designed to help brokers navigate with more efficiency in the fast-paced capital markets. The solutions have been built with an emphasis on real-time data analytics and the complete automation of risk-management processes. The purpose of the risk-management solutions is to significantly improve the broker’s performance from an operational, technological, and financial perspective. Centroid offers a single framework, where brokers can better manage, through various dynamic features and metrics, their existing risk exposure, and also test and implement through advanced algorithms an optimized hybrid model, and lastly access competitive liquidity. "Our company operates based upon three main pillars – advanced technology, constant research and optimized risk-management features," explained Ziad Aboujeb, Founder & CEO of Centroid Solutions. "We want to empower MetaTrader 5 brokers and help them to enhance their company performance, manage business transparency and ensure regulatory governance. Therefore, we offer a fully-fledged, business-integration technology that supports their efforts in that direction." We will present our latest developments and new services for the MetaTrader 5 platform at the FxCuffs 2018 event, which will take place at the ICE Krakow Congress Centre on March 16-17. It is the largest Eastern European conference of investors, which is expected to bring together over 5,000 visitors. More than 70 representatives of the European financial industry will participate in the event, including brokers, investment funds, banks, cryptocurrency start-ups and private investors. "We are now seeing strong interest in MetaTrader 5 in Central and Eastern Europe," says Gaies Chreis, MetaQuotes' Chief Operating Officer. "Poland is one of the fastest growing markets in our industry. Leading regional and local brokers of European origin have already moved to the new platform, and negotiations with a number of other major market players are currently underway. We are going to showcase all the technological power of MetaTrader 5 at the FxCuffs event, and we hope to further strengthen relations with the Polish trading community!" We invite everyone to meet with MetaQuotes' representatives at booth #45 and learn more about our company's products. To set up a meeting with our specialists, please send a request to sales@metaquotes.net. The FxCuffs 2018 admission is free. Please register here. The services of the licensed bank forex dealer are now available for retail clients. LLC "PSB-Forex" is a subsidiary of Promsvyazbank PJSC. Last April, the company received the eighth license of the Central Bank for the rendering of services in the Russian OTC market. A framework agreement with LLC "PSB-Forex" can be concluded remotely via the online Agent's bank - Promsvyazbank PJSC. The online bank also allows deposit of funds to a special section of a nominal account. Withdrawal of funds from a trading account is free of charge. "When choosing a trading platform for our clients, our decision was unanimous. MetaTrader 5 revolutionary solution has no competitors in the market", says Mr Sergey Maslennikov, Managing Director of PSB-Forex. "It is easy to be mastered while it features broad capabilities and remains suitable for traders of all skill levels. The built-in development environment allows implementation of the most ambitious trading ideas. Multiple public services and a well-developed community of users with a long history constitute an indispensable ecosystem. MetaTrader 5 meets the highest requirements in terms of stability and security, while providing flexibility, and an ease of customization with ever-expanding functionality. All this is the result of many years of creative work of the company, which rightfully occupies the position as the industry's sole leader. We are pleased to be at the forefront of the regulated Forex market together with MetaQuotes Software Corp. and offer MetaTrader 5 PSB Forex to our traders!" We have added the functionality of using third-party Anti-DDoS services. The new Anti DDoS Proxy Server component, allows brokers to shift the burden of blocking unwanted connections, to a third-party vendor's server network. When using an Anti DDoS Proxy Server, all clients are connected to the provider's public access points, instead of being connected directly to the access servers. Unwanted connections are sorted out in the provider's own network of servers, while legitimate connections from real clients, are forwarded to the access servers. The broker's infrastructure is practically not affected. Our partner, Akamai Technologies, is one of the world's largest infrastructure companies, offering a portfolio of cloud security solutions. The provider's massively distributed platform, is unparalleled in scale, with over 200,000 servers across 130 countries, thus providing customers with a superior performance and with a superior threat protection. “By leveraging Akamai’s massive global network as a defensive shield, MetaTrader 5 will now be able to immediately bolster the protection of its clients from DDoS attacks", says Mr Josh Shaul, Vice President of Web Security, Akamai Technologies. "Our tools allow stopping attackers long before they are able to reach the MetaTrader 5 systems or clients”. MetaQuotes Software has announced the launch of the marketplace of third-party solutions for MetaTrader 5. The new service will enable financial technology providers to directly offer their goods and services to brokers. The purpose of the Market is to provide clients access to a wide range of MetaTrader 5 solutions from leading global integration companies. Some of the major industry players have already joined the Market, and the range of featured products is gradually expanding. Everyone will benefit from the launch of the new marketplace, including brokers and integrators. Brokers can access a plethora of third-party MetaTrader 5 applications through MetaQuotes' official service. Integration companies can promote their solutions to all institutional users of the platform via this new marketing channel. The new B2B service is expected to stimulate the market and accelerate migration to MetaTrader 5. "We are very pleased to have been selected to be included in the exciting new third party MetaTrader 5 solutions market," Tom Higgins, CEO of Gold-i comments. "This will greatly increase the visibility of our range of MetaTrader 5 products. We are already seeing an increase in sales of MetaTrader 5 related products — our Gold-i MetaTrader 5 Gateway, our MAM for MetaTrader 5, our business intelligence and risk management tool, Visual Edge; and our liquidity management platform, Matrix. The Gold-i Crypto Switch, which provides access to leading global crypto exchanges and crypto liquidity providers, is also proving to be popular.We expect that the new service will create further sales opportunities for us as MetaTrader 5 brokers worldwide will be more informed about Gold-i’s products." "oneZero has been a leading provider of connectivity solutions for the MetaTrader platform for nearly a decade," Andrew Ralich, CEO of oneZero says. "We are happy for brokers to be presented a reliable means to access quality, tested solutions via MetaQuotes' new marketplace. For many years, they struggled to identify which technology companies provided reliable solutions for MetaTrader platforms. The launch of the new Market has finally solved this problem." "The launch of a single marketplace with up-to-date information about new technologies and applications for MetaTrader 5 is an important event for the entire market," Alexei Kutsenko, the Founder and CEO of Tools for Brokers comments on the launch of the service. "Similar to the Market of trading robots for traders, this unique site for institutional clients will enable brokers to keep abreast of the latest developments and find necessary solutions for their business. Participating in this project as a vendor, we can effectively inform our clients about our new products." MetaQuotes Software will present its latest developments and services at the international iFX EXPO Asia 2018 B2B event to be held on January 23-25 at the Hong Kong Convention & Exhibition Centre. Our company will be the Gold Sponsors of the event. At the iFX EXPO Asia 2018, MetaQuotes Software will highlight the recent updates of the MetaTrader 5 multi-asset platform and share its further development plans. This information will be of interest for iFX EXPO Asia visitors since the era of MetaTrader 4 has come to an end, and everyone concerns about migration to MetaTrader 5. At the Expo, you will learn about our plans for the most advanced online trading platform and how these plans will affect the brokerage business. Besides, we will present our latest project — the marketplace of applications for MetaTrader 5 brokers developed by third-party integrators. We will provide more details about the new marketplace for fintech providers during the event in Hong Kong. We invite everyone to visit the booths 58 and 59. See you at the event! London-based Prime of Prime brokerage Stater Global Markets has added MetaTrader 5 to its platform options for clients. The company is also launching a MetaTrader 5 White Label offering. According to Stater Global Markets, it will be in high demand from banks and brokers, particularly in Asia - a key growth region for Stater. Stater Global Markets offers clients direct access to Tier 1 bank and non-bank liquidity, clearing and institutional grade technology. The prime broker's team has many years of experience in both financial and technology companies. This allows for a multi-faceted approach to client support and efficient problem solving. 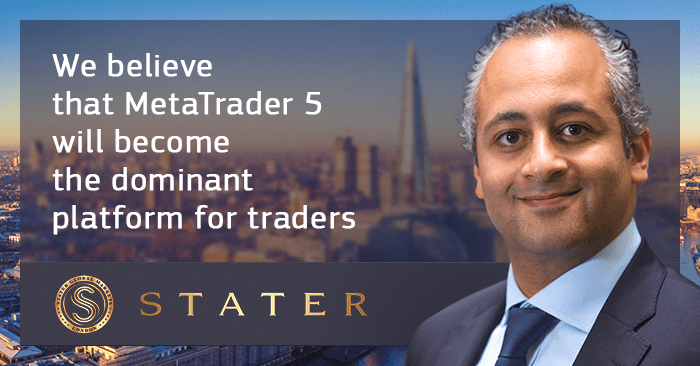 Ramy Soliman, CEO of Stater Global Markets, believes that MetaTrader 5 is far superior to MetaTrader 4 and will become the dominant platform for retail clients. "Brokers are increasingly wanting to offer multi-asset products to clients", says Mr. Soliman. "Meanwhile, MetaTrader 5 is ideally suited for our institutional client base and their multi-asset requirements. We are delighted to have added MetaTrader 5 to the Stater Global Markets portfolio of platforms to offer our clients access to Exchange Traded Futures, Precious Metals and FX. In addition, we have plans to offer trading Cryptocurrencies using MetaTrader 5 in the near future". MetaTrader 5 is developing rapidly. Upon traders' requests, and in an effort to further improve our product, we have added a number of new tools and services to the platform. No such innovations will ever be implemented into MetaTrader 4. Moreover, this is only the first step in the MetaQuotes Software's new large-scale campaign, aiming in expanding the functionality of MetaTrader 5 for traders. The new release features an ability to create synthetic financial instruments. Activation of this feature requires setting the formula for calculating quotes to be based on one or more available instruments. The platform will generate its minute ticks. All subsequent quotes will be built automatically in real time. You create a synthetic instrument and set the formula for price calculation. The platform generates a minute history of the synthetic tool for the last two months. It is calculated based on one-minute bars of instruments used in its formula. The prices of symbols used in the calculation are verified every 10 seconds. If at least one of them has changed, the price of the synthetic symbol is calculated and a new tick is generated. All new bars (current and subsequent ones) of the synthetic instrument are created based on generated ticks. Full-fledged projects simplify the application development for algorithmic trading and constitute another important feature of the build. Instead of the main MQ5 program file, a separate MQPROJ file is used as a project. It stores program settings, compilation parameters and information about all used files. Headers — adding header files. Resources — images, sounds and other MQL5 programs used in the project as resources. Sources — MQ5 files with a source code. Settings and Files — adding other files, such as set files for testing and chart templates. The new MQL5 Cloud Protector mechanism provides an additional layer of protection for trading robots. This protection is similar to the option used in MetaTrader Market, where EX5 product files are additionally compiled to native code. Now, this feature is available to all developers. Protector-backed files can be executed on any computer, similar to common executable applications. To enable protection, execute the following command in MetaEditor: Tools — MQL5 Cloud Protector. Find out more about all innovations of the MetaTrader 5 Build 1730 in Release Notes. Launch the latest MetaTrader 5 version and try out all of its new features. One of the fastest growing international broker Amana Capital has launched MetaTrader 5. The company's top management explained the introduction of the new platform and expressed their desire to stay ahead of the competition. The company offers to clients the possibility to trade Forex instruments in all versions of MetaTrader 5, including desktop and mobile platforms, as well as the web application. Amana Capital Group is a conglomerate of companies providing brokerage services in international financial markets and offering direct access to currency, commodity and stock index trading. The company's representative offices are located in the United Kingdom, Cyprus, United Arab Emirates and Lebanon. "We are delighted to add the multi-asset MetaTrader 5 platform to our current list of products," said Ahmad Khatib, CEO of Amana Capital. "MetaTrader 5 is in the right position of every broker's hand who aspires to maintain an innovative edge in a highly competitive market. The platform offers flexible capabilities and advanced tools, allowing modern traders to benefit from the best conditions in the industry." "MetaTrader 5 was designed to be a platform of choice," said Chief Business Development Officer at Amana Capital, Ziad Melhem. It is the next generation of MetaTrader platforms that was subject to outstanding changes in comparison to MetaTrader 4 and thus offers much wider opportunities to traders. It's important for us that the new MetaTrader 5 services reflect Amana Capital's strategic mission to deliver greater value to our clients, offering them a unique next-generation trading experience." We have expanded the economic calendar geographically by adding the United Kingdom, Canada, Australia and Switzerland on top of the United States, Japan and the European Union. China, Sweden, New Zealand, Mexico and Singapore will be available soon. When a country is added, all economic indices that have a significant impact on the national currency in the calendar are included. Descriptions are professionally translated into 7 languages. This makes our solution different from many others which lack updating since their initial development. One of the key distinguishing features of the MetaQuotes calendar is data completeness. Each indicator has a separate page with a detailed description along with complete data on the event, including its influence on a particular currency. The description also includes a reference to the source, dates of the previous/next releases of the event, as well as its archived values: actual and forecast. For analysis clarity, the entire dynamics distribution is presented in the chart. The development of a professional economic calendar is a complex task which requires considerable time and human resources. Due to the intensive development resources, some companies distribute such products on a commercial basis. Fortunately, this is not the case with our solution — we allow our customers to set it up for free. Some financial resources offer their calendars for free, but with built-in advertising. The professional calendar from MetaQuotes offers no ads and has no plans to introduce them in the future. All data in our calendar, including event descriptions, are fully translated into English, Chinese, Japanese, Russian, Spanish, Portuguese and German. This allows traders from different countries to use the economic calendar in their native language. The complete translation favorably distinguishes our calendar from many other similar solutions which declare support for 10-15 languages. In reality, only interface elements are translated, while event names and descriptions remain in English. On top of the above, our solution accommodates a nice bonus. The widget adjusts to the browser's language and shows your website visitors the calendar in their native language. All this happens automatically without the need for any additional settings. Leading financial data providers feature their own economic calendars which can only be used in their own websites. Our calendar incorporates a convenient widget that can be easily embedded to your website. Traders will no longer have to browse through third-party websites searching for relevant information. Also, the service allows you to attract new website visitors. Our calendar receives news first-hand with no delays. No intermediary websites are used. Each event description has a link to the source. This operation mode is difficult to be implemented, but it guarantees complete reliability and accuracy of the collected data. The MetaQuotes calendar publishes events for countries located in different time zones: United States, United Kingdom, Japan and Australia among others. Important events tracking is maintained via local time adaptation. Manual adaptation of time zones is also possible. This feature provides your visitors with protection against missing news releases. Our calendar is updated automatically immediately after a new event appears in the source. This is different from free versions of some other calendars which need to be updated manually. Our service relieves traders from the necessity of constantly re-loading the page, while it avoids the related negative feedback and an excessive load in the website. The calendar can be set up in just a few clicks. Specify the desired calendar width/height and the default period (the current day or week) here, and you are ready to go. The remaining parameters are adjusted automatically. Simply copy the generated code and paste it in your web page. Provide your website visitors with a ready-to-use tool for monitoring important macroeconomic events. It is free, it has no ads and it is translated into 7 languages! The fifteenth Money Fair Shanghai 2017 brought together tens of thousands of people from all over the world between the 1st and the 3rd of December in China. MetaQuotes Software participated in this large-scale event while the Company representatives described and presented all the new developments for the MetaTrader 5 trading platform and held a number of important Client meetings. Shanghai's Money Fair is the most popular and high-profile financial forum in Asia. The fair is considered a key event for any company striving to develop in Asian markets. Shanghai's Money Fair offers institutional and private investors with not just a standard exhibition, but provides an opportunity communication on a wide range of innovative financial products. "We are proud to be participating for the fourth time at the Money Fair Shanghai", says Eric Lee, the head of MetaQuotes Asia-Pacific office. "This event is an ideal venue to showcase our latest technology as a leading online financial trading platform provider in East Asia, and further expand our relations with existing clients while making contact with new ones. This year, we have seen a good number of MetaTrader 5 promotions by our Clients and an increase in technology partners showcasing and providing their solutions for MetaTrader 5 alongside with us at the event". We thank all the traders and the brokers who visited us in our booth. The feedback we received at the Money Fair will help us further develop our platforms and services by considering the needs of customers in East Asia. The Middle East integration company Noor Index Software Solution has informed of its latest technological announcement: the Bullion Physical Trading plugin for the MetaTrader 5 platform. The application enables physical trading with delivery and storage facilities for precious metals such as gold and silver. Noor Index specializes in providing customizable financial software solutions tailored to suit diverse financial services industries. The company's solutions are built to be scalable, in order to be able to keep up with the latest technologies in the rapidly changing financial and technological environment. Noor Index management representatives say their decision to release a plugin for the MetaTrader 5 platform was based on the growing demand for precious metal trading. So, brokers are now able to offer their clients an advanced method to diversify their investment portfolio using a trading solution fully integrated with MetaTrader 5. "We are proud to say that pioneering the physical trading solution for MetaTrader 5 is a privilege," says Ali Khader, CEO of Noor Index Software Solution. "We always look to design and develop technologies that further enhance trader's experience. We strongly believe that Bullion Physical Trading for MetaTrader 5 will become extremely popular among brokers, investors and bullion dealers, while physical trading will be one of the factors that will revolutionize the trading industry." The Bulgarian representative office of MetaQuotes Software Corp. — MetaPenta Software Ltd. — is to present new services and developments for MetaTrader 5 brokers at the Investor Finance Forum. The Forum is to be held on December 1 at Inter Expo Center (IEC) in Sofia and bring together professionals working in the currency and stock markets. Our company acts as one of the event sponsors. Investor Finance Forum is held by Bulgaria's leading financial portal Investor.bg for the sixth year in a row and is an important event not only for individual investors, but for the entire local financial industry. This year, special attention is to be paid to global economic trends, crypto currencies and practical advice on investing in the current conditions. At the seminar "Time to shift to MetaTrader 5", the representatives of MetaPenta Software Ltd. will highlight the new features in all versions of the MetaTrader 5 multi-asset platform and share its further development plans. The seminar is to be followed by a Q&A session with the speakers. "Six months have passed since the launch of the MetaQuotes representative office in Bulgaria, and we see that the interest in MetaTrader 5 remains as high as before", says Emre Peser, Head of MetaPenta Software. "Large regional brokers Benchmark Finance, Euro-Finance and Varchev Financial Services already offer traders the most advanced platform for multi-asset trading. Several other famous names are on their way. Nevertheless, I see great prospects for further expansion of the market share. We will reveal the reasons for such optimism at the seminar". We invite you to visit our booth in the Inter Expo Center lobby on the first floor and find out all the exciting details first hand. Sign up and buy the ticket to the Forum here. The exhibition of financial technologies Cyprus FinTech Expo was held in Nicosia on November 8 bringing together about 500 industry professionals. MetaQuotes Software Corp. — the developer of the MetaTrader 5 trading platform for arranging brokerage services in any financial market — took part in the event. University of Nicosia: Bitcoin and Blockchain: How will new forms of money and decentralised trust impact financial services? "Our participation in the Cyprus FinTech Expo gave us the opportunity to meet and introduce the MetaTrader 5 offering to local Banks, Financial Institutions and other tech companies. The diversified audience showed interest in the Multi-Asset capabilities and the Cryptocurrency trading support of MetaTrader 5, demonstrating that tomorrow's FinTech needs are already available and accessible today", says Christoforos Theodoulou, representative of MetaQuotes Software. London-based fintech provider Star Hat Solutions announced the availability of the new multi-server products for MetaTrader 5. According to the company's top management, this step results from the market switching to the fifth version of the trading platform from MetaQuotes Software. Star Hat Solutions software products are designed to simplify the transition from MetaTrader 4 to MetaTrader 5. "We are pleased to offer brokers new opportunities to work with multiple servers and provide a simple migration to the innovative MetaTrader 5 platform," says Chris Ward, CEO of Star Hat Solutions. A Multi-server MAM/PAMM service, facilitating master and sub accounts residing on different platforms from each other, with both MetaTrader 4 and MetaTrader 5 server support, amongst others. Tools for Brokers announced the launched of its new Broker Business Intelligence solution for MetaTrader 5 brokers. The module visualizes trading information allowing to monitoring server events, make informed decisions and control risks, as well as helping brokers to prepare regulatory reports. Tools for Brokers' Business Intelligence module creates individual reports and diagrams based on unique metrics and MetaTrader 5 parameters. These reports help brokers make important business decisions about liquidity-based processing of clients' operations, identify valuable customers and detect traders who exploit software vulnerabilities. Brokers Business Intelligence supports notifications and automatic actions enabling brokers to instantly respond to potential threats. "With our business analytics module for MetaTrader 5, brokers have access to the up-to-date information about all events that occur on the server", says Aleksey Kutsenko, the founder and CEO of Tools for Brokers. "One of the most important components of the module is the reporting tool based on broker-specific benchmarks. Reports allow brokers to manage and eliminate risks before they cause irreparable damage to their business." MetaQuotes Software will showcase its most recent developments at the fintech Finance Magnates London Summit 2017. The event taking place on November 14-15th in Old Billingsgate is destined to become the biggest London Summit yet. Top-tier retail brokers, institutional forex investors, fintech providers, as well as representatives of banks, hedge funds and exchanges are expected to attend this prestigious event. At the seminar "Trading on the go with MetaTrader 5", the company representatives will talk about the mobile and web versions of the MetaTrader 5 multi-asset trading platform. The presentation should be of interest to brokers who wish to offer their clients the most comfortable trading on any device: smartphone, tablet or a web browser window. A special focus will be on the MetaTrader 5 mobile web terminal allowing any broker to create their own branded mobile app. The presentation is to be followed by a Q&A session with MetaQuotes Software team members. Leverate, an Israel-based turnkey solutions provider for brokers, has announced the addition of MetaTrader 5 to its portfolio of proposed platforms. The company intends to provide technical support to MetaTrader 5 institutional clients and provide White Labels to forex trading brokers. Since 2008, Leverate has been developing brokerage solutions and services enabling financial institutions to increase conversion, reduce risks and enter new markets. With the MetaTrader 5 platform, the integrator is ready to provide market participants with a complete set of products for establishing a brokerage business and competing with the most successful companies in the industry. "Now, we are ready to work with customers offering MetaTrader 5 to their traders and provide them with all the additional benefits of Leverate", says Yasha Polyakov, CEO of Leverate. "MetaQuotes Software's earlier product, MetaTrader 4, provided the industry standard software for forex. They have since continued to develop and refine this product in the form of the most updated version, MetaTrader 5. This platform will enable Leverate to support their clients with the software that they are familiar with and that traders feel most comfortable using when working with various market assets".